This is the Blog of K9 Pro and Steve Courtney, which in many cases are one in the same. We like to use this Blog to help people see our unique form of Dog Training, Behaviour and some information on the equipment we sell and make. Steve Courtney is the founder of K9 Pro, he is a Nationally Accredited Dog Trainer, Behaviourist and Law Enforcement Dog Trainer. 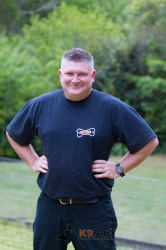 Steve has been working, training and breeding dogs for most of his life. K9 Pro – The K9 Professionals – Online Store that sells the best dog gear in Australia (and beyond). Steve Courtney Dog Training – All about Steve, the services he offers and more. K9Pro Training and Behaviour site – More about Steve, Team K9Pro, services offered and a huge database of FREE Dog Training articles. Herzhund Malinois – Our super dogs! Our Facebook ARMY! – Over 10000 fans as I write this! K9Pro YouTube Channel – Loads of awesome videos. Herzhund Malinois YouTube Channel – Videos of our dogs. K9Pro on Twitter – Keep up to date! You are a dog lover, enthusiast, addict, nut, admirer, aficionado, buff, devotee, fanatic, zealot, freak, worshiper and or owner, would be owner, want to be owner etc. Well at least we think you might be. Hopefully you enjoy reading our posts and are able to learn from them and hopefully make some comments too, we love to see you commenting on our Blog posts. We have read your enthusiastic, motivated posts and posts of support and anger and often we find what you write better than what we do! So keep those replies coming! This Blog is more about you than it is us, you see we really want to help you make the relationship you have with your dog, just that little bit better! Every week we send out an awesome email Newsletter with dog training and behaviour tips and articles, upcoming events, product specials and other cool things. Why don’t you join the thousands of others who love reading our Newsletter. Just add your email address and click subscribe. Don’t worry, we will never give your information to anyone, ever!